Built in 1887, the Southwestern Virginia Mental Health Institute is part of the Virginia National Register of Historic Buildings and was voted one of the most beautiful hospitals in the US. The existing 28′ skylight from this historic structure was well over 100 years old and badly in need of replacement. The old 1″ lead glass was brittle, cracking, and continuously leaking. Any renovation would have to maintain the historical aesthetics of the building and meet the strict requirements of the historical society. The facility was to remain open the entire time, and scaffolding had to be built 3 to 4 stories up to the dome over the large vestibule lobby. It posed many challenges to figure out how to attach the new skylight to the old structure and what elements to maintain for aesthetic reasons. Wasco was chosen because of their extensive experience working on historically sensitive projects in the Richmond, Virginia area. “We specified Wasco’s Horizon translucent polycarbonate system because it’s both lightweight and impact resistant. Replacing the 1″ leaded glass with Wasco’s lightweight polycarbonate panels relieved a tremendous amount of weight off the 120-year-old walls,” said Ricky Lawrence, RA, Chief Information Officer, OWPR, Inc, Architects & Engineers. Wasco had to match the exact layout of the existing dimensions and structural members where no two walls were the same dimension. 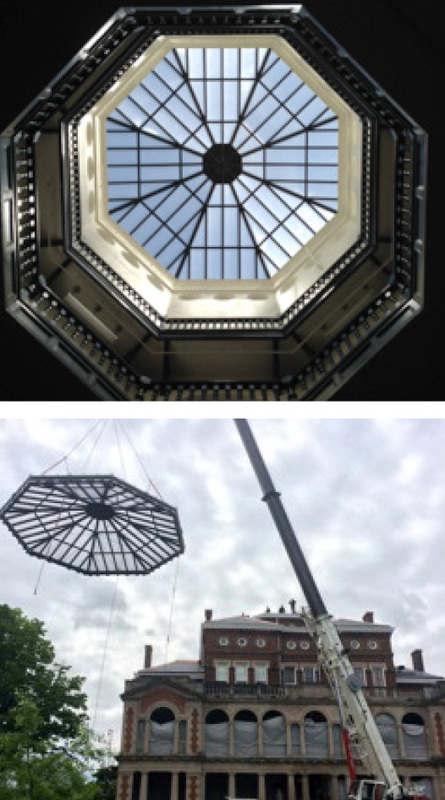 OWPR worked hand in hand with Wasco’s engineering department to design a skylight that replicated the old one, reusing old wood trim and designing metal tire rods whose only purpose now was to reproduce the historical aesthetics. 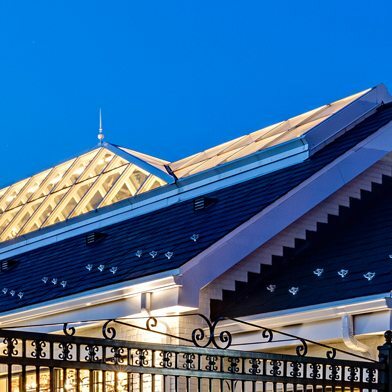 The design team also re-created an ornamental plaque in the middle of the skylight that housed a thermostatically controlled damper for venting excess heat, similar to the old skylight. “Wasco’s sales representative Tom Burke, Architectural Systems of Virginia Inc., and the Wasco team visited the site numerous times to do field measurements and on-site assembly. They even made adjustments right on site so that the skylight fit the structure perfectly, since no two walls were the same dimension. In a project of this magnitude and importance it’s all about the team effort – between Wasco, the facility managers, general contractor and architects. It’s so rewarding when it turns out so well, especially with the many hurdles you face in renovating these historically sensitive structures,” said Lawrence. 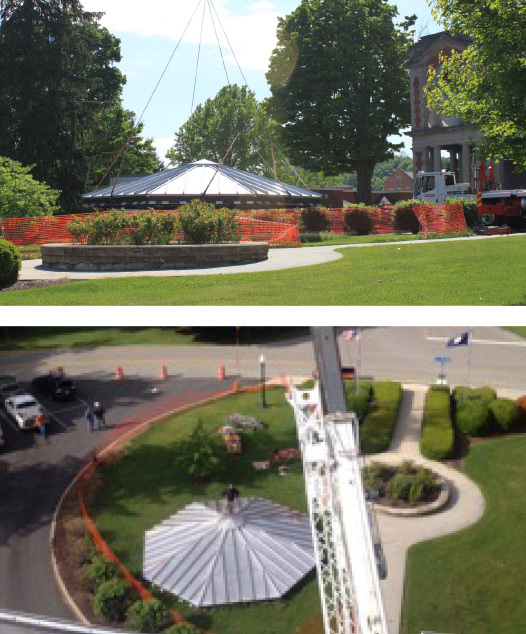 Horizon S-Series Pinnacle 600 Octagonal Pyramid, 27′ 8″ Diameter, 4:12 Pitch. Glazing: Clear 25mm multiwall polycarbonate. For fifty years, OWPR, Inc. has provided innovative design solutions for clients across a diverse range of project types; including educational, recreation, athletic, community, municipal, commercial, and religious. We realize that each project and each client is unique, and we provide a design team tailored to fit. OWPR, Inc. has been built on the foundation of honesty, integrity, loyalty and trust. We have been guided by the philosophy that our clients are our partners – We listen to them. We involve them; in the design and decision-making process. It is with these principles that we have built relationships with our clients that have spanned decades. Above: Wasco’s lightweight Horizon polycarbonate system bathes the vestibule in natural daylight. Below: The crane lifts the single piece structure. The Wasco team visited the site numerous times to do field measurements and on-site assembly.